Take a FREE Tour of Seymour Johnson Air Force Base! The proud home of the F-15E Strike Eagle and the KC-135 Stratotanker, Seymour Johnson AFB has become known and awarded as the “Best Air Force Base in the World.” Housing the largest inventory of F-15Es in the world, Goldsboro is the hub for training and deploying the nation’s best fighter pilots and weapon systems operators. During the tour, you will learn about the multi-faceted mission of the 4th Fighter Wing and the 916th Air Refueling Wing, and how these two “wings” make Seymour Johnson AFB once of the most fascinating and vital bases in the armed forces. And, of course, you’re going to get up-close with the jets, take pictures, and peak inside the cockpit. Plus, it’s highly likely you’ll witness take-offs and air power during your tour! Tours are offered the last Thursday of every month and are absolutely FREE. To secure your spot on a tour, please call our office at 919-734-7922 or email aherring@goldsboronc.gov. Reservations are accepted as late as the day prior. When calling or emailing to reserve your spot, our office will provide the details and directions for the meeting point, Planet Fitness (201 N Berkeley Blvd, Goldsboro, NC 27534) — which is the usual pickup location for the tour. Transportation is provided on an air conditioned bus. Minimal walking is required on the tour. If you need special assistance for the tour or have concerns about mobility, please call our office and we will notify the tour guide of any needs you may have. Most tours begin at 8:30 a.m. and last approximately 3 hours. We suggest you bring water and a snack. If you wish to take pictures, please bring a non-camera phone. Meaning, a camera that is point-and-shoot- and unattached to a cellular device. Please note, pictures are allowed while on the tour, but there are times when pictures are not allowed. We ask guests of the base to be mindful and respectful of sensitive areas. If you are with a group of 20 or more people and are interested in setting up a special tour on a different day, please contact our office to inquire about tour arrangements. Led by Candlelight Tour Company, come to historic downtown Goldsboro to follow a real-life paranormal investigator dressed in period costume up and hear stories of war, death, and spirits that inhabit our fair city! Be prepared to learn the history of Goldsborough, as well as be entertained by the haunted history that awaits. This tour lasts about 2.5 hours; however, the tour guide can customize the tour upon booking to fit the needs of you and your group. Approximately 2.5-3 miles of leisurely walking, so wear comfortable shoes and bring your cameras! 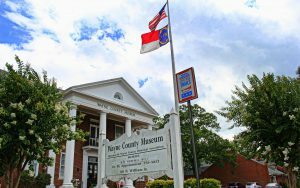 The tour departs from the Wayne County Museum located at 116 N. William St. Parking is free. Tour costs $10/person, and each participant is responsible for their own transportation to follow tour guide to Goldsborough Bridge Battlefield or the Historical Village of Waynesborough, if this site is desired by your group to visit on this tour. To book your tour, contact tour guide, Thomas Bailey, at (919) 738-8946 for times and dates. 10 person minimum for tour. If you are planning a visit to Goldsboro and would like assistance planning your itinerary, please contact the Visit Goldsboro office at (919) 734-7922. The Visit Goldsboro office can help arrange tours for your party.